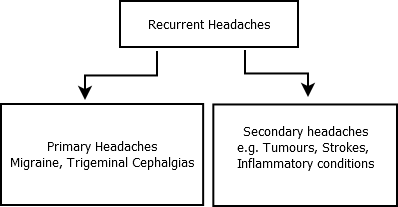 Acute headaches without any concerns of underlying brain pathology i.e. Primary headaches will rarely come to the attention of stroke physicians other than migraine. Migraine with aura is a common cause of associated headache with transient focal neurology and will be discussed below. Thunderclap headaches with sudden onset and intensity peaking within 1 minute should always raise the concern of SAH and these patients need an urgent CT head which is over 99% sensitive if done early. If there is a severe headache and lateralising neurology and no blood on CT then this is likely an ischaemic event. With modern scanners and early scanning CT is incredibly sensitive at diagnosing SAH. Occlusion of a large artery e.g. MCA will often cause an ipsilateral vascular type headache possibly due to increase collateral flow. These patients need urgent consideration for thrombolysis +/- Mechanical thrombectomy once a CT head has excluded any haemorrhage. Depending on the criteria for "thunderclap headache approximately 11-25% patients presenting with thunderclap headache have SAH. Thunderclap headache (TCH) is a sudden severe headache that peaks to maximum intensity within 1 minute. Priorities must be assessed with attention to the seriousness so that SAH, CVT, Stroke and Meningitis and pituitary apoplexy or even CO toxicity need considered and excluded first of all. For those with Thunderclap headache and normal CT and LP the prognosis is very good. Strokes , even ischaemic cause acute headaches. In my early days of thrombolysis I was concerned about SAH but the clues are that the ischaemic stroke headache is usually over the side of the brain affected by the stroke and I suspect it is a vascular type headache due to rediverted flow around and acute obstructed large arterial branch of the COW via collaterals and leptomeningeal branches. CT is over 99% sensitive to SAH in the first 6 hrs and it would be most bizzare to have a raised NIHSS and for SAH blood not to be seen on modern imaging. Here are some other observations. Cerebral venous thrombosis headache is often out of proportion to the bleeding seen and that maybe a clue to warrant looking for the diagnosis. ABC as ever. If comatose and unwell then once stable with intubation and ventilation if needed and then urgent CT head usually will help to define the cause and urgent need. If stable more time can be taken to dwell on the history and exam and need for urgent CT(A/V) and CSF sampling.